RO Technology- even under low water pressure. 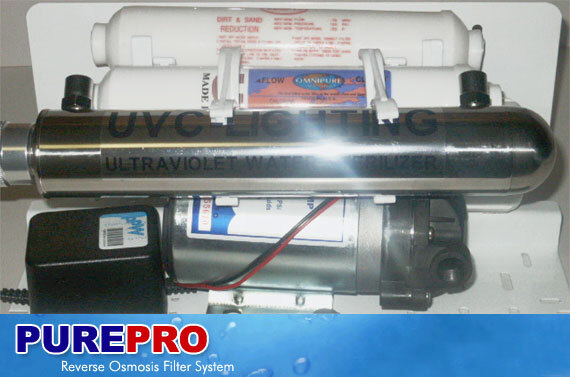 The RO101-SV reverse osmosis water purification system is one of the finest units in its class. It uses a high quality booster pump which can provide 100psi water pressure to pass through the membrane even under low water pressure area. 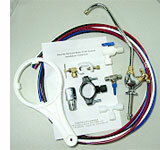 The booster pump prevents damage and prolongs the life of membrane and improve the TDS rejection. RO101-SV offers safe, good-tasting water at your fingertips! It meets all your water quality needs. With 80 gallons of clear, refreshing water that is not only healthy to drink, but good for cooking. RO101SV system provides safe, pure water using Reverse Osmosis Technology. It is one of the finest units in its class. It's capable of removing over 95% of total dissolved solids, +99% of all organics and +99% of all bacteria. This system hides away under your sink and puts healthy great-tasting water at your fingertips. It meets all your water quality needs. Our RO101SV comes complete with a NSF certified 3.2 gallons water storage tank and all the necessary fittings, installation kits, extra color 1/4" tubing, and a long-reach chrome faucet. We don't know of any other system at our price that can approaches its performance. The RO101SV comes complete with a NSF standard 3.2 gallons water storage tank and all the necessary fittings, installation kits, color 1/4" tubing, installation manual and a long-reach attractive faucet. Long Reach attractive faucet . 4 05004 1.8" x 12" size TFC membrane.